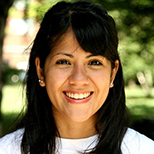 Ann-Marie Alcántara is a recent graduate of Vassar College. She studied environmental and urban studies and in her time there, realized her true love of urban nature. As a native New Yorker, she enjoys spending her time in parks across the city and hopes to run into Andrew Revkin one day. She’s an aspiring environmental journalist, trying her hardest to revive environmental news desks around the country. Currently, she's a media and public relations intern with The Nature Conservancy and vice president of programs at Greening Forward.